"Vitamin B" was once thought to be a single nutrient that existed in extracts of rice, liver, or yeast. Researchers later discovered these extracts contained several vitamins, which were given distinguishing numbers. Unfortunately, this has led to an erroneous belief among non-scientists that these vitamins have a special relationship to each other. Further adding to confusion has been the "unofficial" designation of other substances as members of the B-complex, such as choline, inositol, and para-aminobenzoic acid (PABA), even though they are not essential vitamins. Each member of the B-complex has a unique structure and performs unique functions in the human body. Vitamins B1, B2, B3, and biotin participate in different aspects of energy production, vitamin B6 is essential for amino acid metabolism, and vitamin B12 and folic acid facilitate steps required for cell division. Each of these vitamins has many additional functions. However no functions require all B-complex vitamins simultaneously. Vitamin B-complex includes several different components, each of which has the potential to interact with drugs. It is recommended that you discuss the use of vitamin B-complex and your current medication(s) with your doctor or pharmacist. Human requirements for members of the B-complex vary considerably from 3 mcg per day for vitamin B12 to 18 mg per day for vitamin B3 in adult males, for example. Therefore, taking equal amounts of each one as provided in many B-complex supplements makes little sense. Furthermore, there is little evidence supporting the use of megadoses of B-complex vitamins to combat everyday stress, boost energy, or control food cravings, unless a person has a deficiency of one or more of them. Again, here is no evidence indicating people should take all B vitamins to avoid an imbalance when one or more individual B vitamin is taken for a specific health condition. Most multi vitamin products contain the B-complex along with the rest of the essential vitamins and minerals. Since they are more complete than B-complex vitamins alone, multiple vitamin-mineral supplements are recommended to improve overall micronutrient intake and prevent deficiencies. Our proprietary Star-Rating system was developed to help you easily understand the amount of scientific support behind each supplement in relation to a specific health condition. While there is no way to predict whether a vitamin, mineral, or herb will successfully treat or prevent associated health conditions, our unique ratings tell you how well these supplements are understood by the medical community, and whether studies have found them to be effective for other people. Follow label directions [3 stars] Thiamine (vitamin B1), pantothenic acid (vitamin B5), and other B vitamins have all been shown to play a role in wound healing. For this reason, some healthcare practitioners recommend a high-potency B vitamin supplement to promote wound healing. Thiamine (vitamin B1),1pantothenic acid (vitamin B5),2 and other B vitamins3 have all been shown to play a role in wound healing in animal studies. For this reason, although human research is lacking, some alternative healthcare practitioners recommend a high-potency B vitamin supplement to promote wound healing. 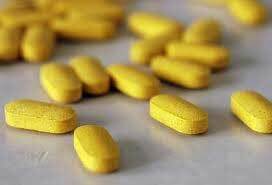 300 mg B1 daily, 20 mg B2 daily, 150 mg B6 daily [2 stars] People with recurrent canker sores may have a B vitamin deficiency. Supplementing with vitamins B1, B2, and B6 has been reported to provide relief. Several preliminary studies,4, 5, 6, 7 though not all,8 have found a surprisingly high incidence of iron and B vitamin deficiency among people with recurrent canker sores. Treating these deficiencies has been reported in preliminary9, 10 and controlled11 studies to reduce or eliminate recurrences in most cases. Supplementing daily with B vitamins 300 mg vitamin B1, 20 mg vitamin B2, and 150 mg vitamin B6 has been reported to provide some people with relief.12 Thiamine (B1) deficiency specifically has been linked to an increased risk of canker sores.13 The right supplemental level of iron requires diagnosis of an iron deficiency by a healthcare professional using lab tests. Refer to label instructions [1 star] The relationship between B vitamins and rosacea is unclear, one study found it caused rocacea-like symptoms, other preliminary reports have found benefits. Preliminary reports in the 1940s claimed that rosacea improved with oral supplements or injections of B vitamins14, 15, 16 On the other hand, one report exists of rosacea-like symptoms in a patient taking 100 mg per day of vitamin B6 and 100 mcg per day of vitamin B12; these symptoms subsided when the supplements were discontinued.17 More research is needed to evaluate the potential benefits or hazards of B vitamins for rosacea. 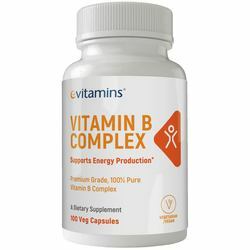 Refer to label instructions [1 star] Research suggests it is possible that successful treatment of B-complex vitamin deficiencies may actually reduce alcohol cravings, because animals crave alcohol when fed a B-complex-deficient diet. Deficiencies of B-complex vitamins are common with chronic alcohol use.18 The situation is exacerbated by the fact that alcoholics have an increased need for B vitamins.19 It is possible that successful treatment of B-complex vitamin deficiencies may actually reduce alcohol cravings, because animals crave alcohol when fed a B-complex-deficient diet.20 Many doctors recommend 100 mg of B-complex vitamins per day. In one double-blind study, 80 healthy male volunteers (aged 18 to 42 years) were randomly assigned to receive a daily multivitamin-mineral formula or placebo for 28 days.21 The multi contained the following: thiamine (15 mg), riboflavin (15 mg), niacin (50 mg), pantothenic acid (23 mg), vitamin B6 (10 mg), biotin (150 mcg), folic acid (400 mcg), vitamin B12 (10 mcg), vitamin C (500 mg), calcium (100 mg), magnesium (100 mg), and zinc (10 mg). Compared with the placebo group, the multivitamin group experienced consistent and statistically significant reductions in anxiety and perceived stress, as determined by questionnaires measuring psychological state. This group also tended to rate themselves as less tired and better able to concentrate. Refer to label instructions [1 star] B-complex vitamins are needed to produce energy from carbohydrates. Exercisers may have slightly increased requirements for some of the B vitamins, including vitamins B2, B6, and B5, athletic performance can suffer if these slightly increased needs are not met. Refer to label instructions [1 star] B vitamins have been used for ADHD. High amounts of B vitamins have shown mixed results in relieving ADHD symptoms. Refer to label instructions [1 star] In one study, treatment with a hydrochloric acid supplement and a vitamin B-complex supplement helped to treat people with hives. According to preliminary studies from many years ago, lack of hydrochloric acid (HCl) secretion by the stomach was associated with chronic hives, presumably as a result of increasing the likelihood of developing food allergies. In one such study, 31% were diagnosed as having achlorhydria (no gastric acid output), and 53% were shown to be hypochlorhydric (having low gastric acid output).34 In a related study, treatment with an HCl supplement and a vitamin B-complex supplement helped to treat people with hives.35Betaine HCl is the most common hydrochloric acid-containing supplement; it comes in tablets or capsules measured in grains or milligrams. One or more tablets or capsules, each containing 5-10 grains (325-650 mg) are typically taken with a meal that contains protein. Diagnosis of a deficiency of HCl and supplementation with HCl should be supervised by a doctor. Refer to label instructions [1 star] For people who have inadequate absorption of vitamin B12 due to low stomach acid, supplementing with vitamin B complex can help correct a deficiency. Refer to label instructions [1 star] In one trial postmenopausal women who combined hormone replacement therapy with B vitamins and other nutrients and dietary changes increased their bone density by a remarkable 11%. One trial studying postmenopausal women combined hormone replacement therapy with magnesium (600 mg per day), calcium (500 mg per day), vitamin C, B vitamins, vitamin D, zinc, copper, manganese, boron, and other nutrients for an eight- to nine-month period.37 In addition, participants were told to avoid processed foods, limit protein intake, emphasize vegetable over animal protein, and limit consumption of salt, sugar, alcohol, coffee, tea, chocolate, and tobacco. Bone density increased a remarkable 11%, compared to only 0.7% in women receiving hormone replacement alone. Refer to label instructions [1 star] Research has linked B vitamin deficiencies to PMS, so some women may benefit from supplementing with B-complex vitamins for symptom relief. Refer to label instructions [1 star] In some studies, taking vitamin B-complex along with other nutrients appeared to prevent the development of tardive dyskinesia. During a ten-year period, doctors at the North Nassau Mental Health Center in New York treated approximately 11,000 people with schizophrenia with a megavitamin regimen that included vitamin C (up to 4 grams per day), vitamin B3 either as niacin or niacinamide (up to 4 grams per day), vitamin B6 (up to 800 mg per day), and vitamin E (up to 1,200 IU per day). During that time, not a single new case of TD was seen, even though many of the people were taking neuroleptic drugs.41 Another psychiatrist who routinely used niacinamide, vitamin C, and vitamin B-complex over a 28-year period rarely saw TD develop in her patients.42 Further research is needed to determine which nutrients or combinations of nutrients were most important for preventing TD. The amounts of niacinamide and vitamin B6 used in this research may cause significant side effects and may require monitoring by a doctor. Refer to label instructions [1 star] PABA, a compound commonly found in B-complex vitamins, has been shown to repigment skin affected by vitiligo. This page was last checked for content and accuracy by Dr. Matt Marturano on January 11, 2019. Dr. Marturano is a licensed naturopathic physician and received his Doctorate of Naturopathic Medicine from the Southwest College of Naturopathic Medicine and a dual Bachelor of Science in Biology and Philosophy from the University of Michigan. In addition, Dr. Marturano currently serves on the Board of Directors for the Michigan Association of Naturopathic Physicians and is the Director of Recruitment - Integrative Medicine for Orchid Holistic Search. 1. Alvarez OM, Gilbreath RL. Effect of dietary thiamine on intermolecular collagen cross-linking during wound repair: a mechanical and biochemical assessment.J Trauma 1982;22:204. 2. Aprahamian M, Dentinger A, Stock-Damge C, et al. Effects of supplemental pantothenic acid on wound healing: experimental study in rabbit. Am J Clin Nutr 1985;41:578 89. 3. Bosse MD, Axelrod AE. Wound healing in rats with biotin, pyridoxin, or riboflavin deficiencies. ProcSoc Exp Biol Med 1948;67:418 21. 4. Porter SR, Scully C, Flint S. Hematologic status in recurrent aphthous stomatitis compared to other oral disease. Oral Surg Oral Med Oral Pathol 1988;66:41 4. 5. Palopoli J, Waxman J. Recurrent aphthous stomatitis and vitamin B12 deficiency. South Med J 1990;83:475 7. 6. Wray D, Ferguson MM, Hutcheon WA, Dagg JH. Nutritional deficiencies in recurrent aphthae. J Oral Pathol 1978;7:418 23. 7. Barnadas MA, Remacha A, Condomines J, de Moragas JM. [Hematologic deficiencies in patients with recurrent oral aphthae]. Med Clin (Barc) 1997;109:85 7 [in Spanish]. 8. Olson JA, Feinberg I, Silverman S, et al. Serum vitamin B12, folate, and iron levels in recurrent aphthous ulceration. Oral Surg Oral Med Oral Pathol 1982;54:517 20. 9. Weusten BL, van de Wiel A. Aphthous ulcers and vitamin B12 deficiency. Neth J Med 1998;53:172 5. 10. Porter S, Flint S, Scully C, Keith O. Recurrent aphthous stomatitis: the efficacy of replacement therapy in patients with underlying hematinic deficiencies. Ann Dent 1992;51:14 6. 11. Wray D, Ferguson MM, Mason DK, et al. Recurrent aphthae: treatment with vitamin B12, folic acid, and iron. Br Med J 1975;2(5969):490 3. 12. Nolan A, McIntosh WB, Allam BF, Lamey PJ. Recurrent aphthous ulceration: vitamin B1, B2 and B6 status and response to replacement therapy. J Oral Pathol Med 1991;20:389 91. 13. Haisraeli-Shalish M, Livneh A, Katz J, et al. Recurrent aphthous stomatitis and thiamine deficiency. Oral Surg Oral Med Oral Pathol Oral Radiol Endod 1996;82:634 6. 14. Tulipan L. Acne rosacea: a vitamin B complex deficiency. Arch Dermatol Syphilol 1947;56:589. 15. Stillians AW. Pyridoxine in treatment of acne vulgaris. J Invest Dermatol 1946;7:150 1. 16. Johnson L, Eckardt R. Rosacea keratitis and conditions with vascularization of the cornea treated with riboflavin. Arch Ophthamol 1940;23:899 907. 17. Sherertz EF. Acneiform eruption due to megadose vitamins B6 and B12. Cutis 1991;48:119 20. 18. Baker H. A vitamin profile of alcoholism. Int J Vitam Nutr Res 1983;(suppl 24):179. 19. Schuckit MA. Alcohol and Alcoholism. In: Fauci AS, Braunwald E, Isselbacher KJ, et al, eds, Harrison s Principles of Internal Medicine, 14th ed. New York: McGraw-Hill, 1998, 2503 8. 20. Norton VP. Interrelationships of nutrition and voluntary alcohol consumption in experimental animals. Br J Addiction 1977;72:205 12. 21. Carroll D, Ring C, Suter M, Willemsen G. The effects of an oral multivitamin combination with calcium, magnesium, and zinc on psychological well-being in healthy young male volunteers: a double-blind placebo-controlled trial. Psychopharmacology 2000;150:220-5. 22. Keith R, Alt L. Riboflavin status of female athletes consuming normal diets. Nutr Res 1991;11:727 34. 23. Van der Beek EJ, Van Dokkum W, Wedel M, et al. Thiamin, riboflavin and vitamin B6: impact of restricted intake on physical performance in man. J Am Coll Nutr 1994;13:629 40. 24. Van der Beek EJ. Vitamin supplementation and physical exercise performance. J Sports Sci 1991;9:77 90 [review]. 25. Winters LR, Yoon JS, Kalkwarf HJ, et al. Riboflavin requirements and exercise adaptation in older women. Am J Clin Nutr 1992;56:526 32. 26. Tremblay A, Boiland F, Breton M, et al. The effects of riboflavin supplementation on the nutritional status and performance of elite swimmers. Nutr Res 1984;4:201 8. 27. Murray R, Bartoli WP, Eddy DE, et al. Physiological and performance responses to nicotinic-acid ingestion during exercise. Med Sci Sports Exerc 1995;27:1057 62. 28. Manore MM. Vitamin B6 and exercise. Int J Sport Nutr 1994;4:89 103. 29. Murray R, Bartoli WP, Eddy DE, et al. Physiological and performance responses to nicotinic-acid ingestion during exercise. Med Sci Sports Exerc 1995;27:1057 62. 30. Bhagavan HN, Coleman M, Coursin DB. The effect of pyridoxine hydrochloride on blood serotonin and pyridoxal phosphate contents in hyperactive children. Pediatrics 1975;55:437 41. 31. Coleman M, Steinberg G, Tippett J, et al. A preliminary study of the effect of pyridoxine administration in a subgroup of hyperkinetic children: a double-blind crossover comparison with methylphenidate. Biol Psychiatry 1979;14:741 51. 32. Brenner A. The effects of megadoses of selected B complex vitamins on children with hyperkinesis: controlled studies with long term followup. J Learning Dis 1982;15:258 64. 33. Haslam RHA. Is there a role for megavitamin therapy in the treatment of attention deficit hyperactivity disorder? Adv Neurol 1992;58:303 10. 34. Rawls WB, Ancona VC. Chronic urticaria associated with hypochlorhydria or achlorhydria. Rev Gastroenterol 1951;18:267 71. 35. Allison JR. The relation of hydrochloric acid and vitamin B complex deficiency in certain skin diseases. South Med J 1945;38:235 41. 36. Gumurdulu Y, Serin E, Ozer B, et al. The impact of B12 treatment on gastric emptying time in patients with Helicobacter pylori infection. *J Clin Gastroenterol* 2003;37:230 3. 37. Abraham GE, Grewal H. A total dietary program emphasizing magnesium instead of calcium. J Reprod Med 1990;35:503 7. 38. Biskind MS. Nutritional deficiency in the etiology of menorrhagia, metrorrhagia, cystic mastitis and premenstrual tension: treatment with vitamin B-complex. J Clin Endocrinol Metabol 1943;3:227 34. 39. Biskind MS, Biskind GR, Biskind LH. Nutritional deficiency in the etiology of menorrhagia, metrorrhagia, cystic mastitis and premenstrual tension. Surg Gynecol Obstet 1944;78:49 57. 40. Piesse JW. Nutritional factors in the premenstrual syndrome. Int Clin Nutr Rev 1984;4(2):54 80 [review]. 41. Tkacz C. A preventive measure for tardive dyskinesia. J Int Acad Prev Med 1984;8:(5)5 8. 42. Toll N. To the editor. J Orthomolec Psychiatry 1982;11:42. 43. Sieve BF. Further investigations in the treatment of vitiligo. Virginia Med Monthly 1945;Jan:6 17.